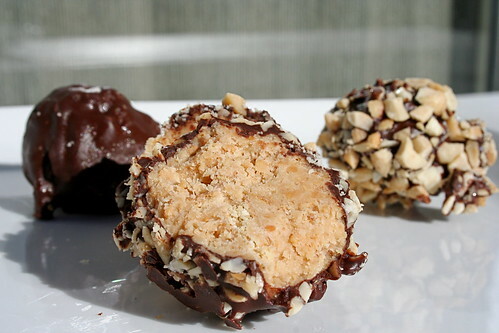 Who doesn’t love vegan balls, especially vegan chocolate peanut butter balls? While these holiday treats aren’t quite as quick and easy as the chocolate chip bars, they’re pretty darn close and definitely as delicious. The other night a friend hosted a Christmas record listenin’ and cookie eatin’ party, and while I had planned on making rum balls, I didn’t exactly plan ahead enough. Rum balls definitely need at least 24 hours to marinate in the rum goodness and I bought graham crackers instead of vanilla wafers, so a back up recipe was much needed. Thankfully I remembered the peanut butter balls, and as long as no one is allergic to peanuts, they’re a crowd pleasing choice. Kind of like a peanut butter cup, but round, and since they’re as easy as crushing graham crackers and melting chocolate I daresay you might want to make a batch for your next party. In a large mixing bowl, combine the powdered sugar and crushed graham crackers. Using your hands, mix in the Earth Balance and the peanut butter until well combined. You should be able to form balls that don’t fall apart. If they’re a little dry (mine were since I used the all-natural peanut butter), add a little vegetable oil. Form 1 inch balls and place on a parchment sheet lined baking tray. Chop the chocolate and melt in a double boiler. You can make your own by bringing 1 inch of water to a simmer in a pot and then placing a heat-proof bowl on top above the water. Place the peanuts in a dish (I used a pie pan). Roll the balls in the chocolate to cover, then roll in the peanuts. Place on the parchment to cool for approximately 1 hour. Totally making these to give as Christmas gifts! Thanks! Nice! I make these as well but use a different recipe. Super tasty. hooooooooooooray for peanut butter balls! dan & i made another batch of them (we used my grandma’s recipe, which is super similar to yours – awesomesauce!) last night for his fire fighting class on saturday – we’re thinking they’ll go over well. i mean, graham crackers, powdered sugar, peanut butter, chocolate – how can you go wrong?! i never thought to add on crushed peanuts before – genius! oh god they sound awesome! I think I’m gonna make some for christmas eve, thanks for posting the recipe. Chocolate and peanut butter – this best combination of ALL time! These look so simple and scrumptious, perfect for Christmas snacking. Thanks! Wow, those look so awesome! I’m going to have to try making some. Thanks for the recipe! Hehee.. I made PB Balls once.. they were delish but of course… no recipe… thanks JES! Mr. Guava will go crazy for these!